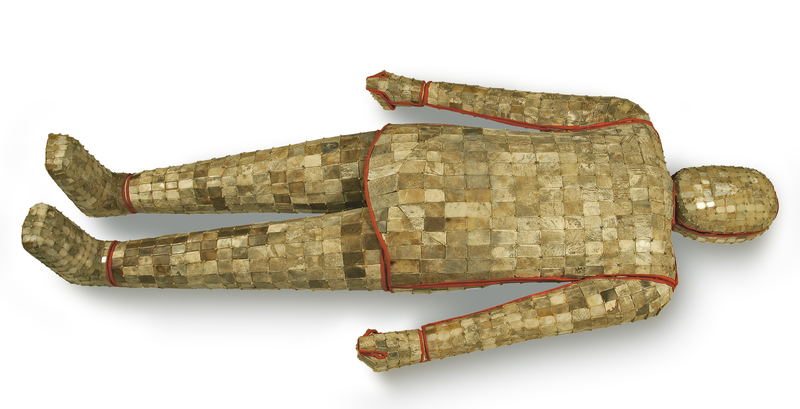 The jade burial suit of Liu Sheng, son of the emperor Jing Di who ruled over the principality of Zhongshan during the Han Dynasty (206 BC- 24 AD), was constructed in the belief that the stone’s magical connection to eternal life would be passed onto the deceased. Encasement in jade may have been one step in transforming his lifeless body into an immortal body of jade. Several suits were made for the Han royalty, and the practice may have evolved from traditions of the Zhou dynasty (1100-256 B.C. ), in which pieces of jade and jade carvings of cicadas were buried with the bodies of the aristocracy. This entry was posted in Uncategorized and tagged 3rd Century BC, China, Death, Han Dynasty, Insects, Magic, Mineralogy. Bookmark the permalink.